In anime, as in real life, one must face formidable opponents. This is especially true in episode 33 of Captain Tsubasa: Road to 2002 (CT 2002). At this point in his career with the Brancos, Tsubasa is facing a most formidable player: Santana, a man with eyes of steel and a determination to match. 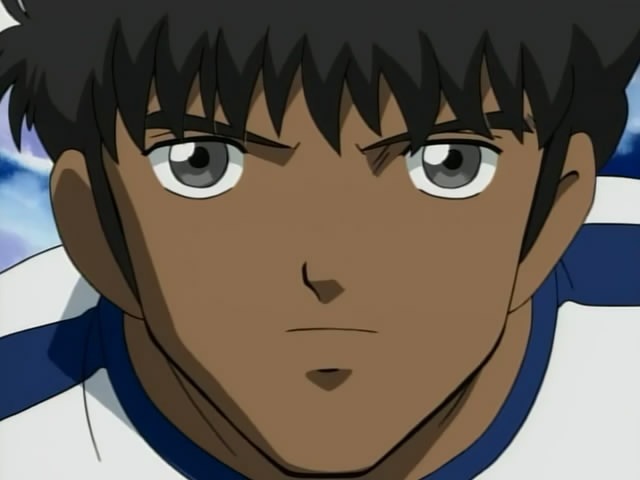 Will Tsubasa be able to score against this player, who is also known as the “Soccer Cyborg”? You’ll have to watch this episode of CT 2002 to find out for yourself! While I’ve been away battling my own formidable opponents in real life, I noticed that several other Saizen Fansubbing projects have been moving forward. Well… I’m happy to report that, with the release of episode 33, Captain Tsubasa: Road to 2002 will be moving forward as well! WooHoo!! Before I end this release post, I want to take a moment to thank everyone (the rest of the CT2002 team AND the fans who have been downloading this series) for hanging around and waiting patiently for me to get back to work on this project. Thanks for not giving up on me, everyone!! Enjoy this episode, and then check back regularly for more exciting episodes of Captain Tsubasa: Road to 2002! Let the match begin!! You can keep waiting, like forever! Probably not gonna be done this year. lol, it’s us who should thank you Torianna, many thanks to C.Tsubasa team who work on this awesome project. Shinsen-Subs?! Do they still exist as a group?! Yes, but without a translator. Rock on people, rock on! What about the first 12 episodes? Infusion already did those, therefore we prioritize unsubbed eps, and it looks like we won’t be doing them once we’re finished either. It’d only be a waste of time, something that is exclusive already to our dear editor. Can anyone tell me where i can download the first 12 episodes? ?